Repertoire: Do You Hear What I Hear? (arr. 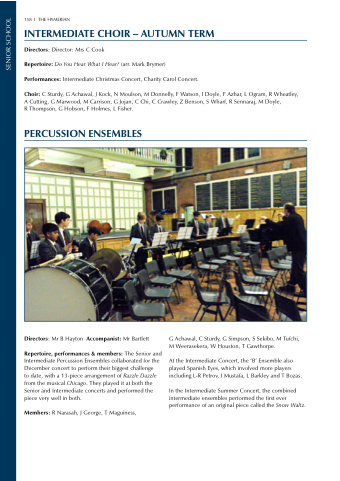 Mark Brymer) Performances: Intermediate Christmas Concert, Charity Carol Concert. R Thompson, G Hobson, F Holmes, L Fisher. to date, with a 13-piece arrangement of Razzle Dazzle from the musical Chicago. They played it at both the Senior and Intermediate concerts and performed the piece very well in both. G Achawal, C Sturdy, G Simpson, S Sekibo, M Tufchi, M Weerasekera, W Houston, T Gawthorpe. At the Intermediate Concert, the ‘B’ Ensemble also played Spanish Eyes, which involved more players including L-R Petrov, I Mustafa, L Barkley and T Bozas. In the Intermediate Summer Concert, the combined intermediate ensembles performed the first ever performance of an original piece called the Snow Waltz.